The award-winning and haunting novel from Rodrigo Hasbún, the literary star Jonathan Safran Foer calls, “a great writer,” about an unusual family’s breakdown—set in South America during the time of Che Guevara and inspired by the life of Third Reich cinematographer Hans Ertl. Inspired by real events, Affections is the story of the eccentric, fascinating Ertl clan, headed by the egocentric and extraordinary Hans, once the cameraman for the Nazi propagandist Leni Riefenstahl. Shortly after the end of World War II, Hans and his family flee to Bolivia to start over. There, the ever-restless Hans decides to embark on an expedition in search of the fabled lost Inca city of Paitití, enlisting two of his daughters to join him on his outlandish quest into the depths of the Amazon, with disastrous consequences. “A one-sitting tale of fragmented relationships with a broad scope, delivered with grace and power” (Kirkus Reviews, starred review), Affections traces the Ertls’s slow and inevitable breakdown through the various erratic trajectories of each family member: Hans’s undertakings of colossal, foolhardy projects and his subsequent spectacular failures; his daughter Monika, heir to his adventurous spirit, who joins the Bolivian Marxist guerrillas and becomes known as “Che Guevara’s avenger”; and his wife and two younger sisters left to pick up the pieces in their wake. 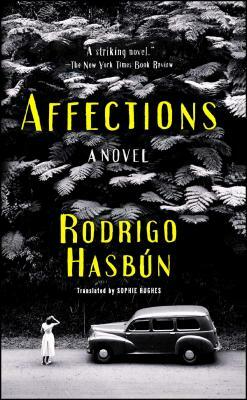 “Hasbún writes with patience and precision, revealing the family’s most intimate thoughts and interactions: first smokes, blind love, and familial devotion. This is a novel to savor for its richness and grace and its historical and political scope” (Booklist, starred review)—a masterfully layered tale of how a family’s voyage of discovery ends up eroding the affections that once held it together. Sophie Hughes has translated novels by several contemporary Latin American and Spanish authors, including award-winning Laia Jufresa and Rodrigo Hasbún. Her translations and writing have been published in The Guardian, The Times Literary Supplement, Literary Hub, and The White Review, among others. In 2017 Sophie was awarded a PEN/Heim Translation Fund Grant.